“The Good Dinosaur” presents a beautiful film that is visually advanced beyond any animation we have seen to date. 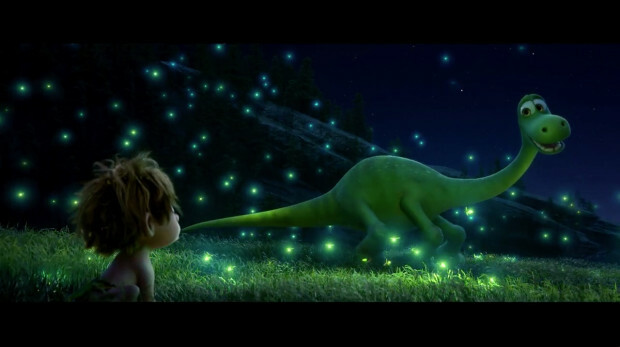 The story focuses on a young dinosaur named Arlo who grows from being the runt of the litter to the hero of the family. Take a look at these beautiful visuals below. Even these stunning stills don’t quite do the photo-realisticness justice. 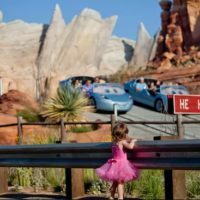 I appreciated the world that the dinosaurs inhabited. Even going into the film, I knew that the most difficult element would be the character design for the dinosaurs. In the end, they chose to have more cartoony dinosaurs, which provided a stark contrast against the realistic background. 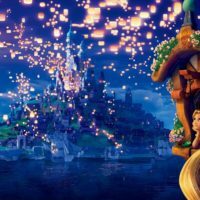 As you may have noticed, I have yet to even mention the story, and for a Pixar film that’s a big deal. In an attempt to explain the story, I would classify the movie as a mixture between “The Lion King” and “Finding Nemo.” These are two of my favorite movies, which really caused me to enjoy this finding-the-way-home classic. The film didn’t present any groundbreaking setting (i.e. “Inside Out“) but rather a familiar struggle to be reunited with family. While there were some humorous moments, the film overall had a darker tone, that I hadn’t been expecting. For large chunks, there was a feeling of unease and tenseness that is comparable to the darker scenes with Sid from “Toy Story.” As an example, John Ratzenberger, usually one of the top providers of comic relief in every Pixar film, actually voiced an evil villain. 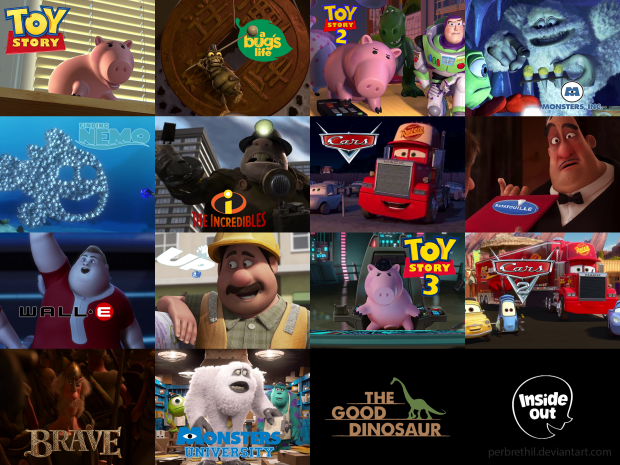 These are the characters that John Ratzenberger has voiced for Pixar over the years. 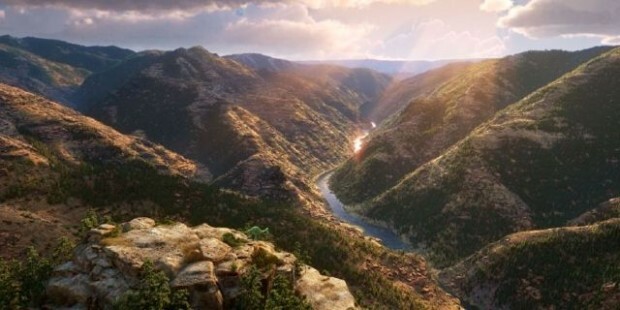 Spoilers* About fifteen minutes into the film, the gorge scene from “The Lion King” is almost exactly replicated as Arlo’s father is lost in a flash flood. This sets off a series of events causes Arlo to end up lost, miles from home. During the trip back, he meets a human companion, who joins him on his journey. The human is not yet as evolved as the dinosaurs, is unable to speak, and seems more of a pet companion. My favorite scene in the film comes when Arlo meets a family of T-Rexs who are characterized as cowboys roaming the open plains with their herd. This segment offered welcome humor after the darker opening of the film. 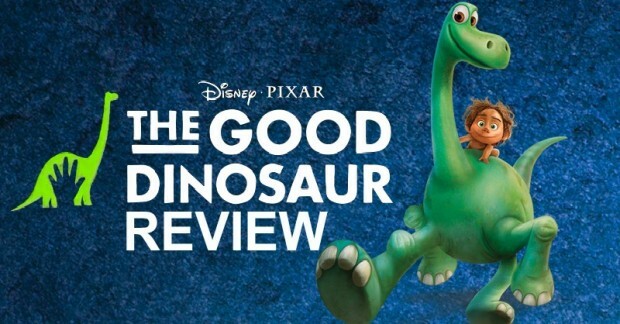 Overall “The Good Dinosaur” is not in my top Pixar favorites, but you need to go out and see this film. Take this as a preview for the capabilities of the Pixar Animation team. 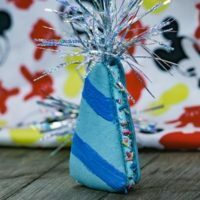 I wonder how these new found skills will be applied to the ocean world of “Finding Dory.” I guess we’ll just have to wait and see to find out. Yeah, although the movie was pretty to watch, unfortunately I was disappointed with the derivative story. When I saw the trailor with the thought “What would have happened if the meteor missed the Earth?” I thought I would see an amazing world! But all I got was a cartoon dinosaur walking across endless scenery. A bit negative, I know, but I thought that Pixar missed an opportunity here. Well said Lee. That concept was so intriguing. I wish that they had taken the idea even farther into the future. Would have been very fun to see the dinosaurs intermixed with people in our world today.